WaMu Falls. RIP on its 119th Birthday!! WaMu was set up on 25 September 1889..last price =0.164 cent!! 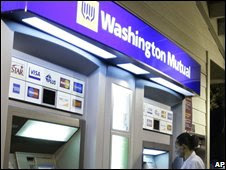 Washington Mutual (WaMu) has become the biggest US bank to fail, as regulators were forced to take control and sell off the mortgage lender. The Office of Thrift Supervision (OTS) sold its assets to JPMorgan Chase for $1.9bn (£1bn) after $16.7bn of deposits had been withdrawn in 10 days. 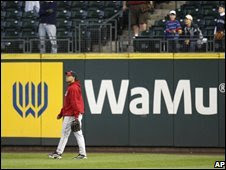 Regulators were quick to reassure customers that WaMu would be trading as usual despite the change of ownership. WaMu was hit by mortgage defaults the collapse of the US housing market. "For bank customers, it will be a seamless transition," said Stella Blair, chairman of the Federal Deposit Insurance Corporation (FDIC). "Bank customers should expect business as usual come Friday morning.